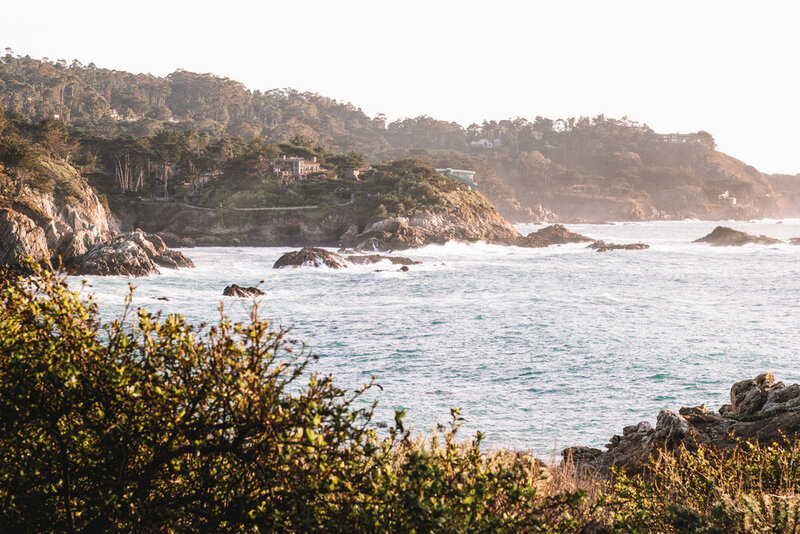 Only two hours from San Francisco, but seemingly worlds away, the charming little town of Carmel transports you to another country or another time with it’s signature fairytale architecture and location steps from the Pacific ocean. As I walked through town, exploring courtyard after courtyard plush with potted annuals and window boxes pregnant with greenery, the sidewalks buckled beneath my feet, tree roots slowly disrupting the bricks, yet adding to the coziness of this small town. I breathed in the smell of pine and eucalyptus, mixed with a wisp of sea breeze, and exhaled the stress of the city life that I left behind for the weekend. This recently renovated boutique hotel offers 27 rooms in the center of town, each with it’s own private balcony, comfortable beds, plush robes, and a hotel sponsored happy hour each night featuring local wines. See our full lodging review here. Another newly remodeled and smartly designed boutique hotel in downtown Carmel, The Getaway pulls inspiration from its coastal setting featuring a white brick exterior with blue doors, rattan furniture, cement tiled bathrooms, and white wood paneled interior walls. A boutique B&B with a cozy string light lit patio with Adirondack chairs and a fireplace, The Vagabonds House is another downtown hotel freshening up the scene in Carmel. Stationæry | San Carlos Square | Lattes are served in hand thrown ceramic mugs made in Oakland and the avocado toast is served with a soft boiled egg on top. The food is top tier and the design is impeccable. This place is a must for breakfast and/or brunch. Cultura | Dolores Street between 5th & 6th | Known for their mezcal flights, Cultura is smokey Mexican served in an intimate setting. Our favorites were the carnitas tacos, grilled veggies, crickets (yes, crickets! ), and mezcal-white chocolate panna cotta. I’d drive down to Carmel just for a spoonful of that panna cotta. It was one of the most unique and delicious desserts my palate has had the pleasure of tasting. Brophy’s Tavern | A gastropub connected to Hotel Carmel, Brophy’s Tavern is a classy sports bar that serves local caught halibut in its fish and chips and thick cut bacon in its cobb salad, and well crafted cocktails. La Bicyclette | Dolores & 7th Street | La Bicyclette serves delicious pizzas in a cozy space, as if plucked from the streets of Paris. Seventh & Dolores | 7th Avenue & Dolores Street | A modern steakhouse located in downtown. Etats-Unis | Dolores St between 5th & 6th Ave | The delicious smells drew us here. Etas-Unis is a small French American bistro that would make for a sophisticated romantic dinner. Hike Point Lobos | Moments after arriving in the park, we spotted a whale in the distance, a sea otter in the cove below, and pelicans flying above. This park nurtures the soul with abundant nature sightings, crashing blue waves, and rocky cliffs. 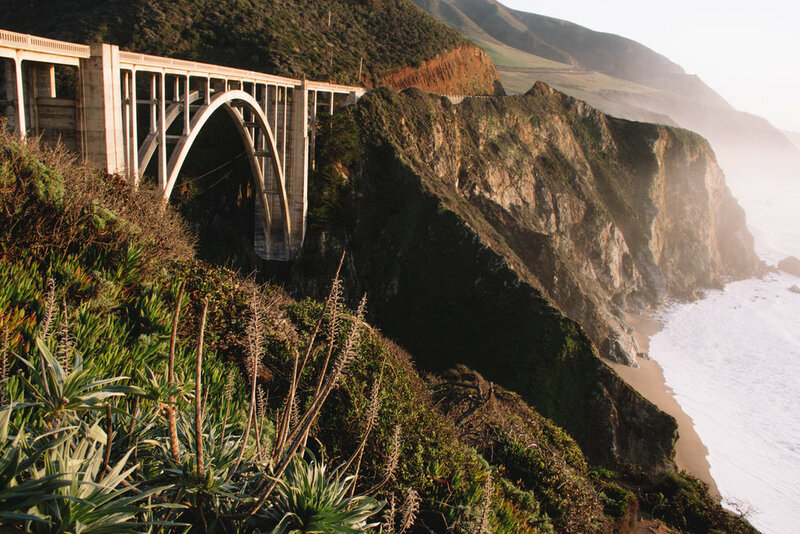 Watch the sunset at Bixby Bridge | A 25 minute drive from downtown Carmel, Bixby Bridge gained even more popularity from being in the Big Little Lies intro, and for good reason. This stunning bridge built in the early 30s crosses a steep valley along the coast on Highway 1. The light and experience is best 40 minutes before sunset. Sip wine at Folktale Winery | A short uber ride away and set on stunning property, enjoy a couple hours sipping wine at the charming Folktale Winery. We loved their sparkling rosé. Wander + Shop the fairytale-like Downtown | Carmel’s charm lies in its village feel. So go. Explore these quaint streets without too much of an agenda and stumble upon the Mexican tiled steps, hidden gardens, and bright doorways yourself. Enjoy the Beach | A visit to Carmel wouldn’t be complete without some time at the beach. Easily accessible on foot, simply take Ocean Ave from downtown to reach the beach, and then walk along the beach path south to see more charming homes and breath in that ocean air. Visit the Mission | The Mission San Carlos Borromeo del río Carmelo is the second oldest Mission in California and is located near Point Lobos and Carmel River State Beach. An interesting historical stop to fit into your trip. Bee, Bark, & Moss | Handmade textiles and bags by a husband and wife pair, if you step into one shop during your visit to Carmel, let this be the one.